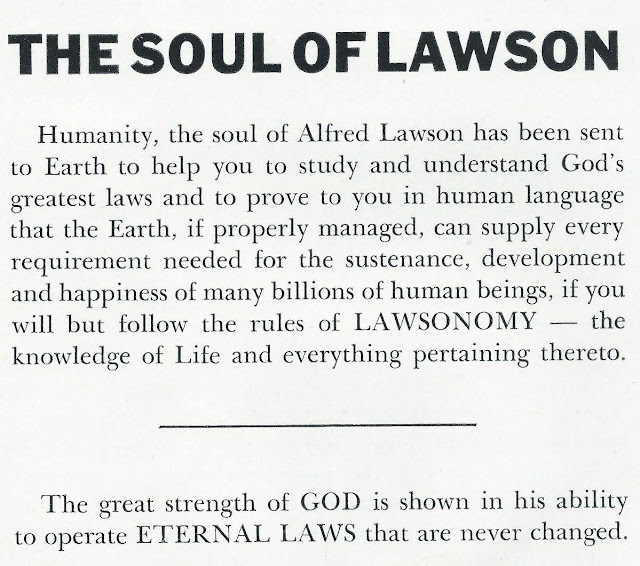 LAWSONOMY; "Ignorant Are They Who Profess To Be Educated Without Knowing These Things"
So more recently, I've been obsessing over the now possibly extinct religion, Lawsonomy. Described as a "whole new philosophy" that encompasses everything from economics, science, education, health, and of course, religion. There was a really fantastic documentary made recently called "Manlife" that everyone should check out. 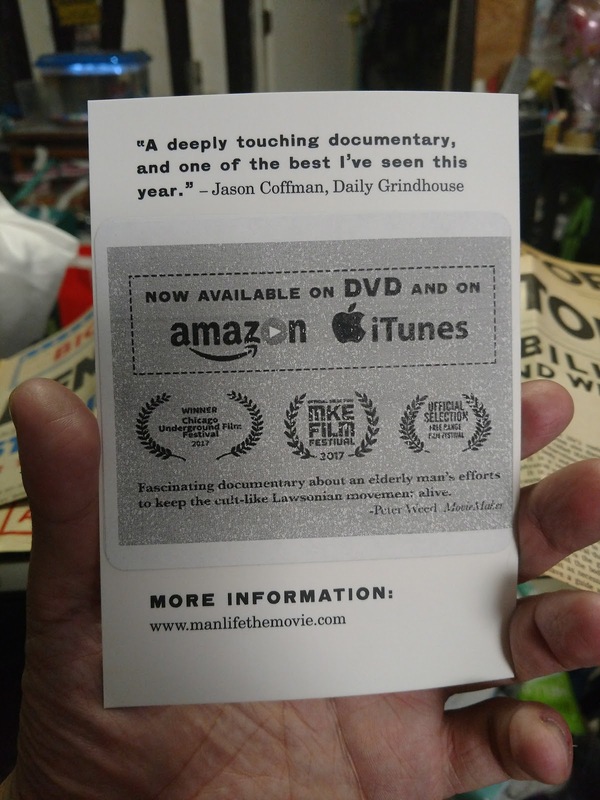 Really the best documentary they could have made about Lawsonomy. It's beautiful, sad, and wonderful to behold. I watched it on Amazon Prime and was nearly at tears about 5 times. I really can't recommend this movie enough. On my health blog, Buoyant Vitality, I've been trying to focus on the Lawsonian related ways of living life in a physical manner, but I am still on the hunt of specific texts I need before I can really get started. 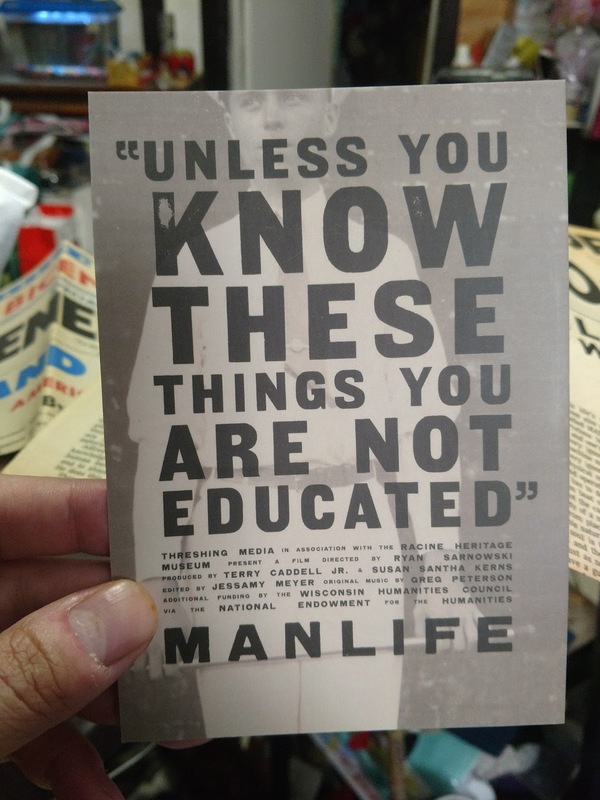 I did type up a short page about my overall feelings about Lawsonomy, but I might transfer that to this page once I find the books "Manlife", "The New Species", and a few others. Hell, I may even create a new blog specifically about Lawsonomy at this point. I mean, I may as well. 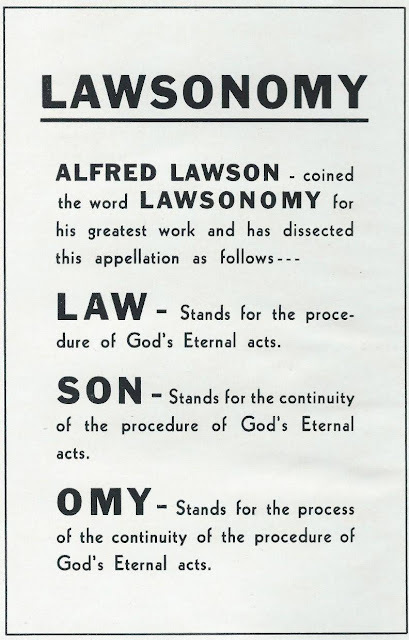 But anyway, what is "Lawsonomy"? 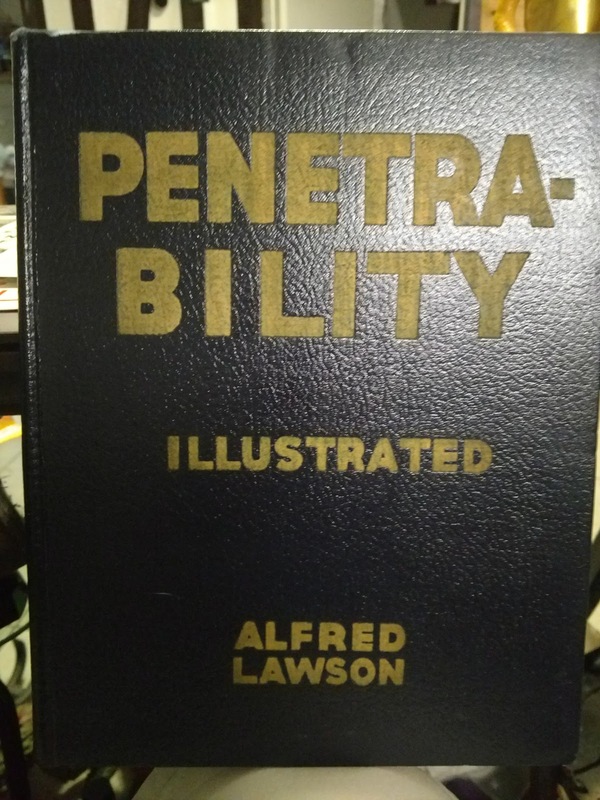 Well it's a particular philosophy created by Alfred Lawson, a polymath and eccentric man, which encompasses his particular view of the world. 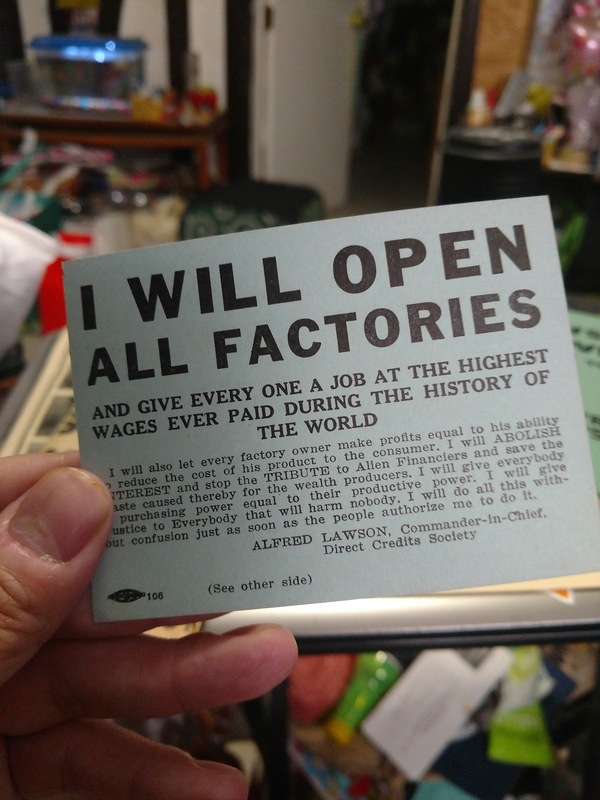 It started as an economic movement with the Direct Credits Society, and eventually led to The University of Lawsonomy and the Lawsonian Religion. Lawson himself was never deified, but some of his followers did look up to him as some sort of spiritual leader and teacher. Lawson though never claims to be God, at least, not in any of the texts I have read. He was a smart man with a big ego, but I do feel like he was trying to better the world in his own way. He wasn't bigoted, or misogynistic, or petty in any sense, and he worked hard to create a spiritual philosophy that made sense. 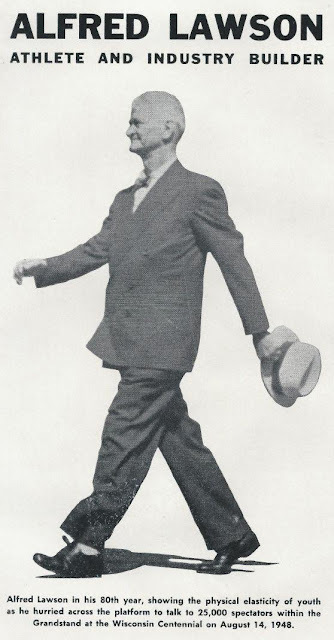 He even created his own lingo and nomenclature so that certain ideas could be conveyed better. 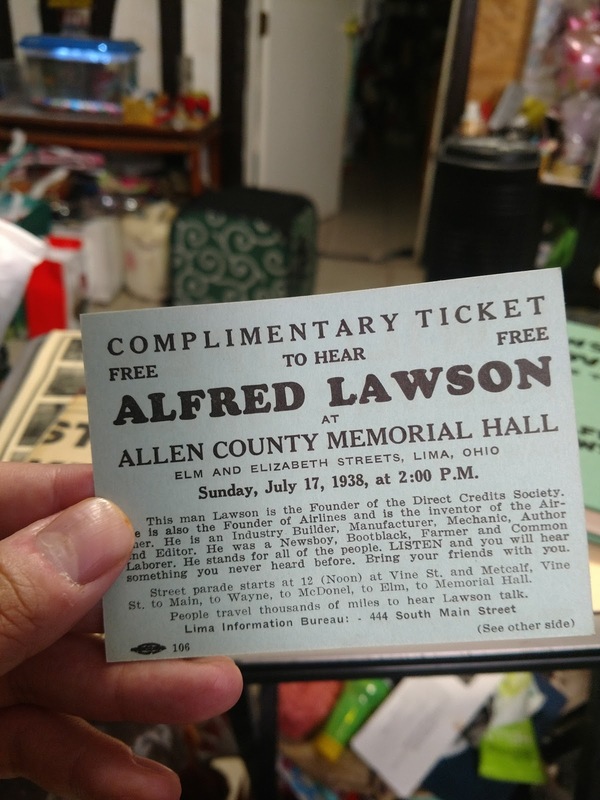 Still, Lawson's ego was quite potent. He talks in a manner that conveys that he feels like he had a mission in life, and a destiny to fulfill. Certainly though, he reached for the sky and he did many great things in his life. 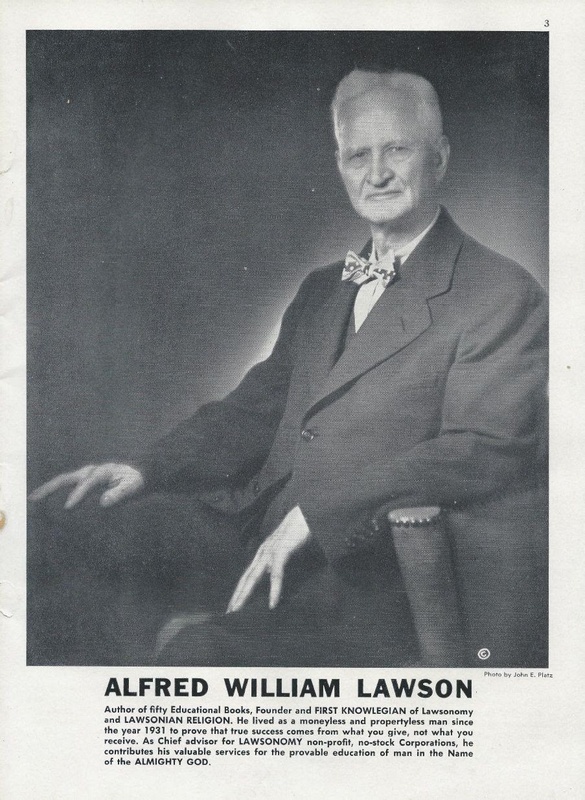 Although not credited in any schoolbooks for his achievements, Lawson did design and create the first airliner, played professional baseball when the sport was still in it's infancy, and had thousands of followers as members to his Direct Credits Society. My Lawsonomic studies are still at the beginning of it all. I'm currently reading "Born Again", which is in a sense the "bible" of Lawsonomy. And a wonderful person, and producer of the film "Manlife" sent me some amazing literature to read and study. I really love the "Lawson's Proverbs" book as it has in it a lot of the wisdom I've come to expect from Lawsonomy. 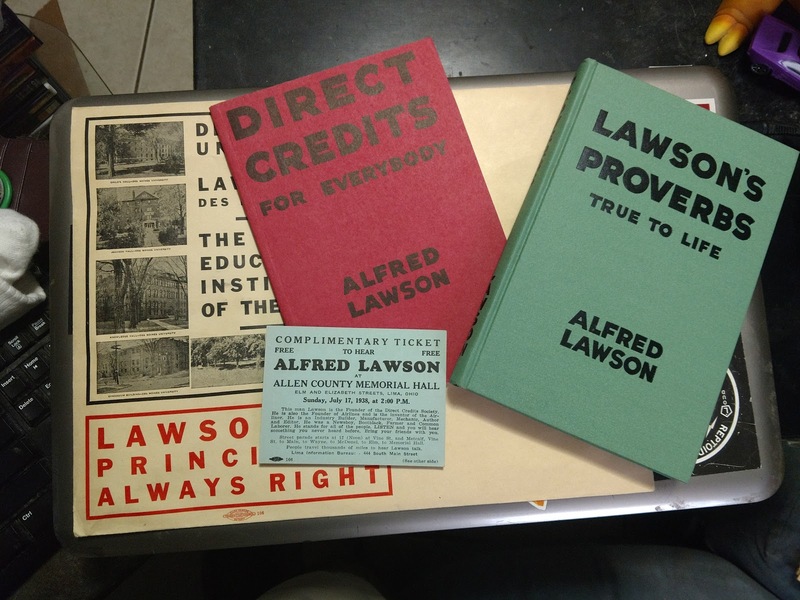 The "Direct Credits for Everybody" is also interesting; I'll finally be able to understand what Lawson meant by "Direct Credits". So that's all for now. I plan on utilizing this blog again, so keep checking for updates. 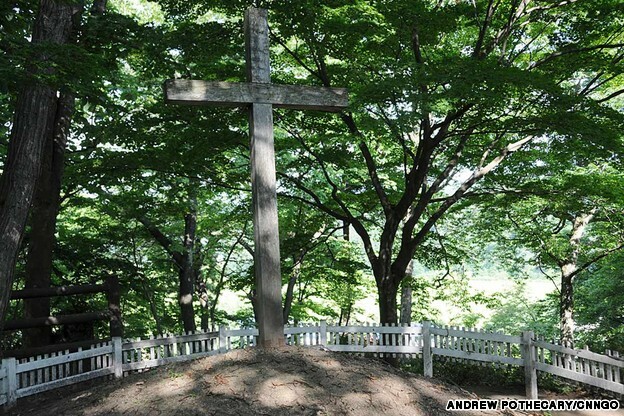 I want to visit the Tomb of Jesus Christ in Japan! I was in Japan back in 2007, and it was a life-changing experience for me. I met a lot of wonderful people who I'm still friends with to this day. One thing I learned about the Japanese people was how they were predominately irreligious. Rather than being religious, they were more superstitious. Many people aren't against religion, and in fact, some facet of Buddhist or Shintoism is a large part of their life. 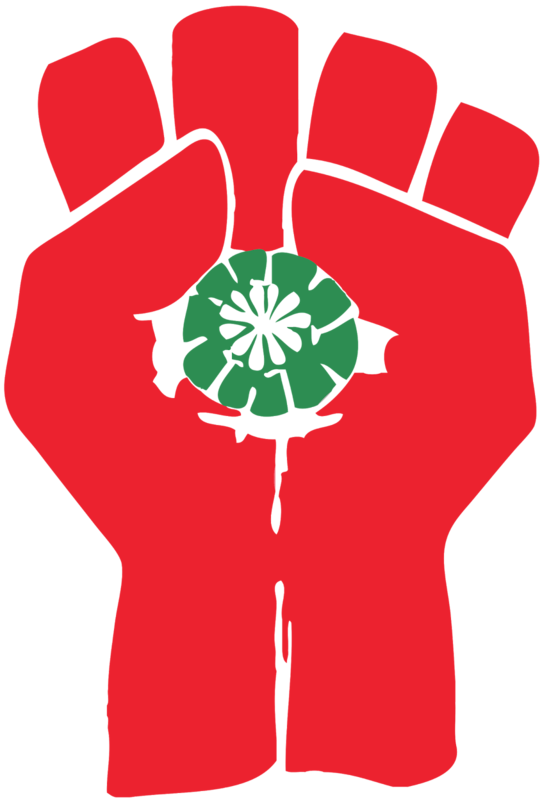 Instead their secular spiritual beliefs are expressed through charms that are purchased and blessed at local temples and shrines. Now each shrine has a particular duty, or deity that it is dedicated to. I visited quite a number of these places while I was there and they were all beautiful. What I didn't know then, and what I found out only recently, was that there is a burial site and shrine dedicated to Jesus Christ of Nazareth. Now, had I known about this sacred place I would have made time to go visit this shrine. 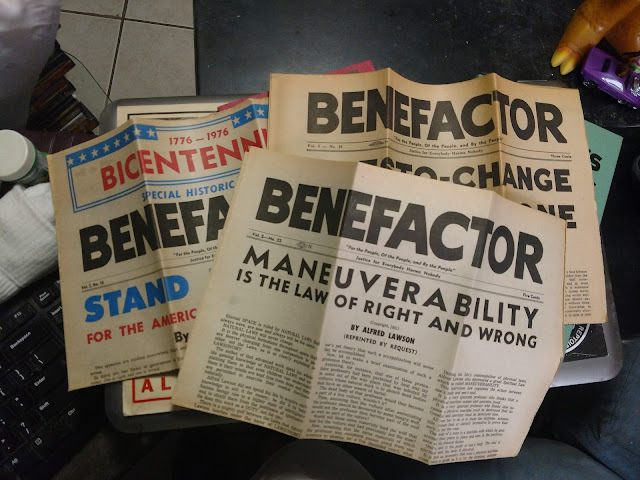 What a strange anomaly from a different time. Shinto-Buddhist hybrid shrines is one thing, but this is that dedicated to the messiah of a different religion. How strange! I love it! "The Japanese original is the work of the self-styled cosmoarcheologist Wado Kosaka (1947-2002), who not only transcribed the original “Takenouchi Documents” but also — according to the preamble to Volume 1 — attracted national attention in the 1970s when he contacted a UFO on live television. A cross marks the spot where the remains of Jesus supposedly are. I did a bit of research on the documents that say he was buried in this spot, and they are part of a "new religion" called "Mahikari" ("True Light"). I'm not sure if there is much of a movement left with this religion, but there seem to be a few remnants of this existence here and there. Every year, in June, there is a festival and ceremony to celebrate Jesus and Isukiri and their deification. There is also a museum with all sorts of artifacts on display. This all takes place in a little town in Japan called Shingo, in the Aomori Prefecture. That's a long way from Jerusalem, and they say Jesus crossed over Alaska to get there somehow! What a far out place. I don't know what to make of it. I'm not even convinced the locals care of the tales are true or not because its such a boon for the economy there every year. On one hand this might be a complete insult to a strict Christian, but on the other hand at least this community is trying to make some sort of connection with such an important religious figure. It's all how you look at it. Personally I think this is pretty spectacular, and I really hope I can visit this shrine someday. Hunter S. Thompson is probably one of my favorite people to read about. His books are all phenomenal, his personality was outrageous, and his views were so amazingly honest it's no wonder he became the cultural icon that he is. He's one of my heroes if I'm being honest; I have such a high regard and respect for him that it saddens me to know that I'll never get to meet him in person. Thankfully though, this doesn't mean he can't appear as an apparition in one of my dreams. 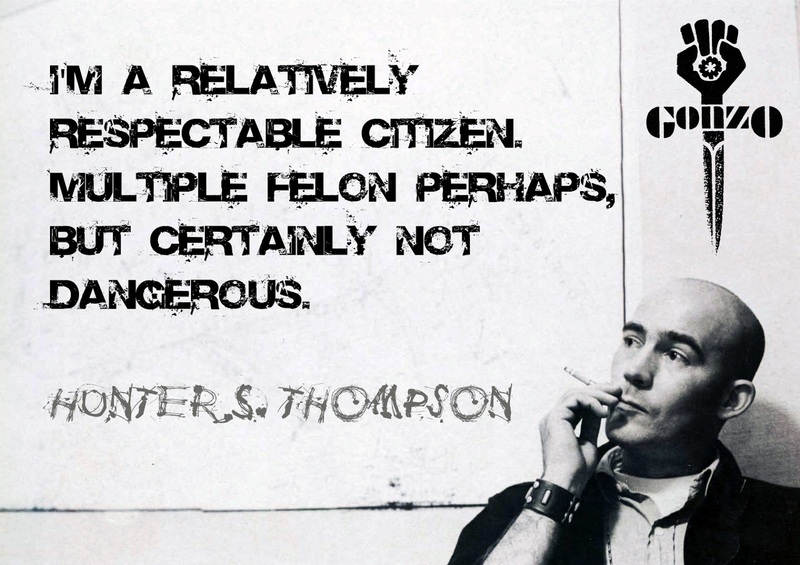 So last night I dreamt that Hunter S. Thompson himself wanted to show me and some friends the different classes of society. Hunter had a sinister sort of grin on his face as he looked at us and how nervous were looked. I was nervous for sure, but I was pretty excited prospect of Hunter taking us on one of his tours. Hunter started to tell us about there being two classes of people; freethinkers and zombies. Freethinkers were often poor, came from small towns or ghettos, and prefer being honest and hardworking than being spoon fed. I'm not sure if this is how Hunter actually viewed the world, but it is definitely something coming from my subconscious. I do feel that most people are "asleep" or "zombified" to some degree, especially when you consider how wealth can blind you to the real treasures of the world. And if you read any of the works by Hunter, you can definitely see his disdain for those elite people and officials who systematically rob from the poorest of citizens. Near the end of the dream Hunter takes me and my friends to the second floor of a two story structure. The first floor was filled with good people, who were genuine and kind, and just trying to help one another. The second floor where Hunter took us was filled with literal zombies who looked down from giant windows to stare at the people on the first floor. 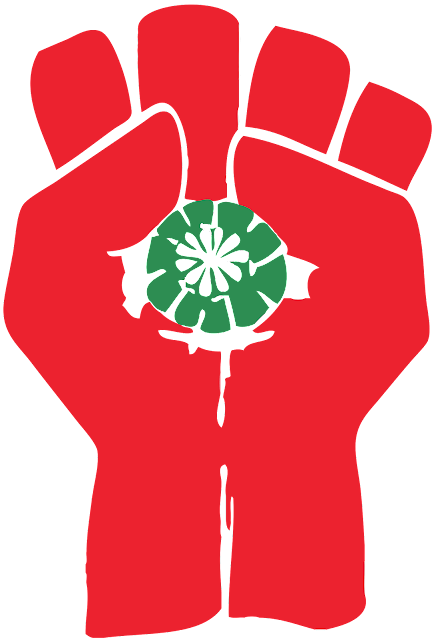 The zombies seriously hated the people below, and blamed all of their misfortunes and their current states on them. They killed the freethinkers from the first floor out of anger and devoured them in hopes of gaining their happiness. When Hunter finally forced us to enter the second floor we saw all sorts of riches and treasures, and we were in awe of them. 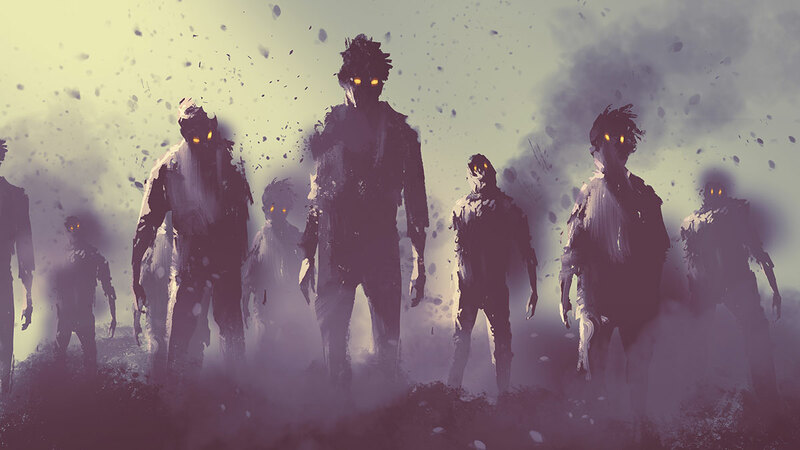 Then we noticed that the zombies were all glaring at us with their red glowing eyes, as if our very existence was disgusting to them. They wanted us dead, and Hunter wanted to ruin their day. Hunter started to fire a shot gun he had brought with him into the air to scare them, then he aimed for their heads and blew their rotten brains out. He told us to start running towards the giant window that was across the way from us. While we ran and ran, Hunter kept shooting the zombies, challenging them, and cursing them out. My friends and I just ran, scared and exhilarated towards the giant window. The window was something you would probably see in a cathedral as it was arched and ornate, but the glass was pure white. I screamed and asked Hunter why are we going to that window, and he replied that the zombies were afraid too look out this particular one. When we finally reached the window we looked out and saw nothing but a endless white landscape. Hunter told us to jump through, and we obviously refused. He then called us pansies and pushed us through the glass window, which brought in the brightest light I could ever imagine. It was like staring at the sun. The dream ended with Hunter telling us to enjoy the experience while we can, and to savor the glow. What is the shape of our world? Hydrillium Fuel of the Future! Copyright Guillermo Briceno 2016. Simple theme. Powered by Blogger.